People get wine, even if they don’t get wine. My parents proclaim Yellow Tail to be the best thing they’ve ever tasted, but even they understand that there’s a difference between Yellow Tail and not-Yellow Tail. Things aren’t so different with chocolate. You’ve got your crap chocolate, chock full of stabilizers, wax and milk powder to distract you from the fact that it really tastes nothing like chocolate; and you’ve got your high-end, single-plantation chocolate that was produced by real people for actual tastebuds. So where do you go to learn more? You take a chocolate-tasting class. With, ahem, me. Or, more specifically, my alter ego, The Well-Tempered Chocolatier. Think small classes, funny stories—and chocolate, chocolate, chocolate. All classes take place at Xoxolat in Vancouver (2391 Burrard Street, at West 8th Avenue). Get a crash course on chocolate vocabulary and learn how to connect those words with what you’re tasting. You’ll get two rounds of tasting: a guided tasting to learn common flavours in chocolate…and then a blind tasting, to put your tastebuds to the test. The Good, The Bad and the Ugly: Can You Taste the Difference in Chocolate? Based on a label, most people can tell crap chocolate from good. But can your tongue tell? Sample a smattering of chocolates in varying levels of quality to see if you’re up to the challenge. Take a gastronomic tour of Venezuela, known for the diversity and flavour of its cacao. What’s the deal with Fair Trade and organic chocolate…and is it enough? Find out about the politics of chocolate and why stickers on the label don’t tell the whole story. EDIT: Due to scheduling issues, these classes have been postponed to the Fall. If you’re interested in a private or corporate tasting, please contact Eagranie. 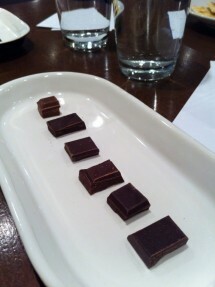 A Night with Theo Chocolate /Chocolate-Tasting Class at Kafka’s Coffee and Tea /Ich Wünsche Meine Schokolade Bitte!